What if your favorite game was real and built on a lie? So many players use Forever Fantasy Online (FFO) to escape their real life, whether it’s due to stress, low self-esteem, or illness – FFO is their refuge. They can be successful, the best at what they do, whether as guild and raid leaders, class gurus, achievement completionists, etc. They have beautiful armor and weapons made by the gods. Many would love FFO to be their reality, all their dreams come to life. Tina, James, and a whole slew of other gamers are about to find out that it’s a whole new world in FFO today; those logging in will have a rude awakening. Many won’t live through the day. All the non-player characters (NPCs), from quest givers to quest targets, from village inhabitants to raid bosses… Yeah, they’re all seriously PO’d and out for blood. Players’ blood. They’ve been trapped for decades inside what they call “the Nightmare.” Now their nightmare has ended, and they are free to fight back. The players are in for a whole world of hurt. Having played MMORPGs for many years, including World of Warcraft, Final Fantasy, and Phantasy Star Online 2, I’ve met all the stereotypical players from elitist jerks to that G.I.R.L. (Guy In Real Life) with their over-endowed Barbie dancing in their undies on the mailbox for gold. Aaron and Bach nail stereotypical player types, classic quests, and heartbreaking storylines. Not to mention they raise common player questions, such as, “If I saved the world, why doesn’t it stay saved?” And they do it in the greater context of players suddenly caught in an alternate reality without their best gear, without their addons and customization, in a world where the NPCs know more about their magic than they do. It’s a situation that brings out the best and the worst in the players, as they race against death to the safety of what they believe is an allied fortress. Aaron and Bach present a story that leaves many questions unanswered in the first book, and veteran readers will know from the Eli Monpress and Nice Dragon series to expect that the storylines and questions will get twistier and deeper before it’s over. While many story arcs are brought to a conclusion, this is the first book in the series and obviously open-ended. Just as the game expands and populates, I expect the series to unfold like an origami flower, so many aspects there and yet hidden, waiting beyond the next bend. I found Tina unlikeable at times, although she worked miracles holding a disparate group of strangers together as well as she did, plus she had some character growth through the book, which I expect to continue into the next book. After all, she’s really just a 21-year-old library science major who’s really out of her depth. James was more sympathetic, but also had more character growth, I felt. Overall a lot this is a book where those of us who game will notice all the nods to zones and classic quests/quest types, but those who don’t game are given enough background that there’s no deficit to the story. Overall, a fun read that left me looking forward to the next book. 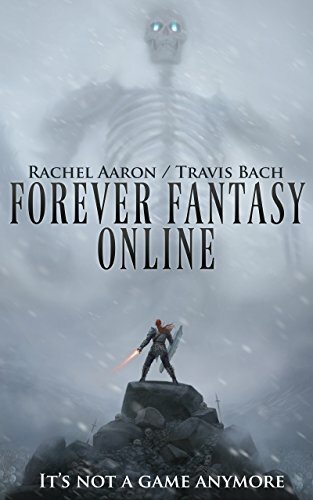 In the real world, twenty-one-year-old library sciences student Tina Anderson is invisible and under-appreciated, but in the VR-game Forever Fantasy Online she’s Roxxy—the respected leader and main tank of a top-tier raiding guild. Her brother, James Anderson, has a similar problem. IRL he’s a college drop-out struggling under debt, but in FFO he’s famous—an explorer known all over the world for doing every quest and collecting the rarest items. Both Tina and James need the game more than they’re willing to admit, but their escape turns into a trap when FFO becomes real. Suddenly, wounds aren’t virtual, the stupid monsters have turned cunning, and death might be forever. Separated across a much larger and more deadly world, their skill at FFO is the only thing keeping them alive. But as the harshness of their new reality sets in, Tina and James soon realize that being the best in the game is no longer good enough.